This lesson reviews the fundamentals and prerequisites for this course, how to run Perl and the examples, and goes through a sample program as a practical way of reinforcing that information, plus an introduction to Perl’s documentation format. We tackle references, the key to objects: How to create named and anonymous references to scalars, arrays, and hashes, ways of deferencing, creating and traversing hierarchical data structures, code references and dispatch tables, and top it off with an example implementing the Game of Life. This lesson shows how to separate code into files and use packages for namespaces. It provides the basis for code reuse and the distinction between compile- and run-time executed code. We look at some useful modules, such as CGI.pm, and others for date manipulation and HTML templating, and how to find what you need on CPAN. After looking at how object programming in Perl rapidly becomes repetitive, we show how to simplify it using the Moose framework, and how to use attributes, roles, delegation, and method signatures. Exploring more useful and complex CPAN modules, we first look at DBI for database interfacing, using SQLite and MySQL as examples, and then move on to WWW::Mechanize for web server interaction, and HTML::Parser for web page parsing, adding in a module-driven progress meter. 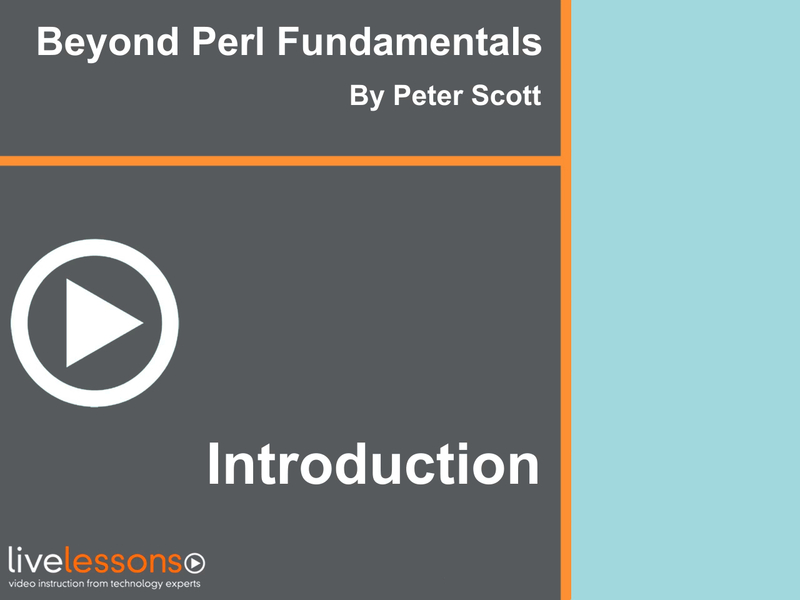 In this video, Beyond Perl Fundamentals LiveLessons, Perl author and trainer Peter Scott builds on the foundation established in his successful Perl Fundamentals. It provides Perl developers with the practical knowledge they need to create complex programs for today’s demanding applications. After a prerequisite review and a tour of some more advanced regular expression features, this course takes off down a path of crafting and using reusable code. Explaining references and multidimensional data structures opens the door to creating modules and objects. Applied object-oriented programming comes in for special attention as Scott covers best-of-breed modules available for database and web programming, and how to install them from the Comprehensive Perl Archive Network. The course concludes with a project using the Dancer framework to build a web-based application. If you already understand the basics of Perl programming, this video will give you the advanced education you need to master the real power of Perl and use it at today’s leading-edge technology businesses. interfaces based on each lesson’s topics. introduction to Perl’s documentation format. saving regular expressions in variables, and named capture groups, with a little diversion into Unicode. references and dispatch tables, and top it off with an example implementing the Game of Life. basis for code reuse and the distinction between compile- and run-time executed code. explanation of Perl’s exception handling and testing mechanisms. templating, and how to find what you need on CPAN. using the Moose framework, and how to use attributes, roles, delegation, and method signatures. HTML::Parser for web page parsing, adding in a module-driven progress meter. templates, and database integration to demonstrate the simplicity of implementing a complex site. Download the Beyond Perl Fundamentals tar file.